Filmmaker Monet Allard-Wilcox followed a contingent of the Sisters of Perpetual Indulgence to Shanghai Pride to document their participation in the week long event. 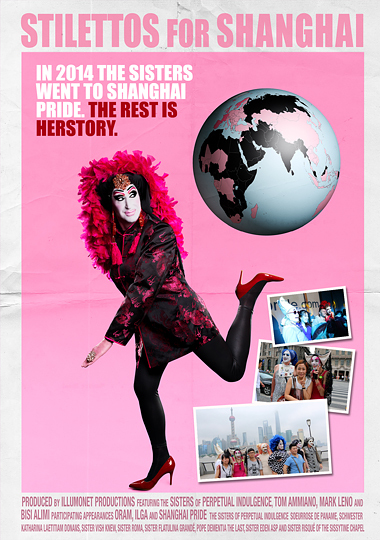 At the time Shanghai pride was only 6 years young and the only recurring Pride event in ALL of mainland China. The Sisters of Perpetual Indulgence, an order of drag nuns started in San Francisco, are a now global organization with a history of activism and a penchant for humor and dazzling costumes. Stilettos for Shanghai discusses the status of LGBTQ people internationally. The film explains the origin of the Sisters with interviews and archival footage never seen before on the big screen, and it follows the Sisters to Shanghai to chronicle their participation and reactions to Chinese culture. With interviews from prominent gay San Francisco based leaders and the human rights organization ORAM, Organization for Asylum and Migration, the film shares with the world the critical issue of international LGBTQ Rights and the serious work being done by a group of dedicated, glamorous and often flamboyant drag nuns. When they were invited to Shanghai Pride they didn't know what to expect, but it was a calling they had to answer.